Afghan Sikhs carry the coffin of one of the 19 victims of a suicide attack in Jalalabad on July 2, 2018, a day after the attack. 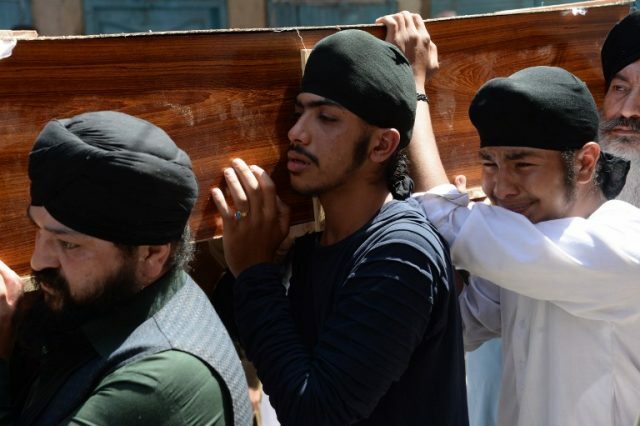 Grief mixed with anger among Afghanistan’s minority Sikh and Hindu community on July 2 as they prepared for funerals of loved ones, including an election candidate, killed in a suicide attack. Grief mixed with anger among Afghanistan’s minority Sikh and Hindu communities on Monday as they prepared for funerals of loved ones, including an election candidate, killed in a suicide attack. Scores of mourners shouted “death to Ashraf Ghani” and “death to the government” as they placed coffins in ambulances that would take them to a temple for funeral ceremonies. “This attack has killed many of our elders, those who loved their country more than anything else,” Narendar Singh told AFP as he took the body of his father, Avtar Singh, from the hospital. Singh said a group of 20 Sikhs and Hindus had planned to meet with Ghani in the morning at the provincial governor’s compound but the meeting was postponed until the afternoon. “That is when a suicide bomber on foot detonated among us,” Singh said. Jagandar Singh, who lost his brother in the attack, said the mourners would consider taking to “the streets in Kabul” to express their anger at the government’s inability to protect civilians. “We have lost hope with this government,” he said. IS was not part of the government’s recent 18-day ceasefire with the Taliban that expired on Friday. The government’s unilateral truce overlapped with the Taliban’s three-day ceasefire for Eid. It was marred by two suicide attacks in Nangarhar that were claimed by IS.